Orange Date Muffins are my idea of the perfect breakfast muffin. One look at the list of ingredients will tell you how rich and satisfying these muffins will be. First off, the dry ingredients include whole wheat flour which, because it is milled from the entire whole wheat berry, it still contains its bran (fiber) and its germ (rich in oil, protein, iron and vitamins). We do add some all purpose flour as well, and that is because using the two flours makes for a lighter textured muffin with more rise than if we had used just whole wheat flour. Next, the wet ingredients, and here we add the fresh citrus flavor of orange juice and zest (zest being the outer skin of the orange which contains the fruit's flavor and perfume). Buttermilk gives these muffins their tender crumb. You can buy commercial buttermilk or buttermilk powder. Or you can make a good substitute. Stir 3/4 tablespoon lemon juice into 3/4 cup (180 ml) milk. Let stand at room temperature 10 minutes and it's ready to use. While dates have not been in vogue for quite a few years they are an ancient fruit that provides a high sugar content and are also a good source of protein plus Vitamins A & B. They are native to the Persian Gulf and are the fruit of the palm tree, that grow in large bunches, with each date measuring up to 2 inches (5 cm) long. For this recipe we are using dried pitted dates and they are mainly sold in plastic tubs located in the produce section of your grocery store. Along with the dates is the addition of walnuts, and these two ingredients work very well together, with neither one overpowering the other in flavor or texture. Back in 1984 Gail Sher came out with her book "From a Baker's Kitchen". This cookbook is full of bread recipes, both yeasted breads and quick breads. It is one of those great cookbooks that's full of useful information. In depth information on ingredients, equipment, and technique. This is definitely a book worth reading and actually using. The pictures that she includes are line drawings that only add to the book's appeal. 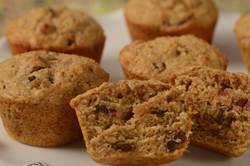 This recipe for Orange Date Muffins is one I adapted from her book. Enjoy! Orange Date Muffins: Preheat your oven to 375 degrees F (190 degrees C). Place rack in the middle of the oven. Butter or spray, with a non stick vegetable spray, 12 regular sized muffin cups (or line with paper liners). In a large bowl, combine the flours, sugar, baking powder, baking soda, salt, ground cinnamon, and orange zest. Stir in the chopped dates and walnuts. In a separate bowl, mix together the orange juice, buttermilk, egg, vanilla extract, and melted butter. Evenly divide the mixture among the 12 muffin cups. Place in the oven and bake for about 15 - 18 minutes, or until a toothpick inserted in the center comes out just clean. Place on a wire rack to cool.